Apollo 11 (Armstrong, Aldrin, Collins)‹Blast off-July 16, 1969‹Landed on the Moon at 2:17 p.m. (Florida time), July 20th, 1969. ³It was presumably when the two moon-walkers, Aldrin and Armstrong, were making the rounds some distance from the LEM (Lunar Effect Module) that Armstrong clutched Aldrin¹s arm excitedly and exclaimed: ŒWhat was it? What the hell was it? That¹s all I want to know.¹ There followed further snatches of gasping interchanges between the two astronauts, with Mission Control chiming in frantically. ³The next day, Saturday November 15th, the three Apollo 12 astronauts DID report to Mission Control at Houston that they had sighted two bogeys (UFOs). COMMAND MODULE PILOT (CMP): What are you learning? GROUND CONTROL (GC): Hot spots on the Moon, Jack. CMP: Where are your big anomalies? Can you summarize quickly? GC: Jack, we¹ll get that for you on the next pass. CMP: Hey, I can see a bright spot down there on the landing site where they might have blown off some of that halo stuff. GC: Roger. Interesting. Very‹go to KILO KILO. GC: Roger. We got it. And we copy that it¹s all the way down there. Go to KILO KILO on that. CMP: Mode is going to HM. Recorder is off. Lose a little communication there, huh? Okay, there¹s Bravo, Bravo, select OMNI. Hey, you know, you¹ll never believe it. I¹m right over the edge of Orientale. I just looked down and saw the lights flash again. CMP: That¹s on the EAST or Orientale. CMP: I¹ll be damned. I¹ve got to mark that spot on the map! NOTE: The importance of this is immediately seen if one considers the possibility that our Moon is an artificial satellite. Another important question also comes to mind: Could the method used to analyze the Moon¹s motion be applied to the Earth¹s motion as well, to determine if it, also, is hollow? Scientists have never had the opportunity to study Earth from a distance, thus making the carrying out of such observations impossible. But from orbiting space-stations (like the Soviet ŒMir¹ station), these studies would be QUITE possible to carry out. If this has not already been done, (and realizing how much our government really tells the public, it probably HAS been), it SHOULD be, and SOON! This would add another LARGE piece of evidence in the already PONDEROUS case in favor of the Hollow Earth Theory. In fact, the more one studies our mysterious Moon, the more light is thrown onto the Hollow Earth Theory as well. DUKE: These devices are unbelievable. I¹m not taking a GNOMON up there. YOUNG: O.K., but man, that¹s going to be a steep bridge to climb. DUKE: You got‹YOWEE! Man‹John, I tell you this is some sight up here. Tony, the blocks in Buster are covered‹the bottom is covered with blocks, five meters across. Besides the blocks seem to be in a preferred orientation, northeast to southwest. They go all the way up the wall on those two sides and on the other side you can barely see the outcropping at about 5%. 90% of the bottom is covered with blocks that are 50cm and larger. DUKE: Right out there…the blue one that I described from the lunar module window is colored because it is glass-coated, but underneath the glass it is crystaline…the same texture as the Genesis Rock…Dead on my mark. DUKE: I can¹t believe it! CAPCOM: Dover. Dover. We¹ll start EVA-2 immediately. DUKE: You¹d better send a couple more guys up here. They¹ll have to try (garble). DUKE: Boy, I tell you, these EMUs and PLSSs are really superfantastic! SCHMITT: I see tracks‹running right up the wall of the crater. MISSION CONTROL (Gene Cernan): Your photopath runs directly between Pierce and Pease. Pierce Brava, go to Bravo, Whiskey, Whiskey, Romeo. 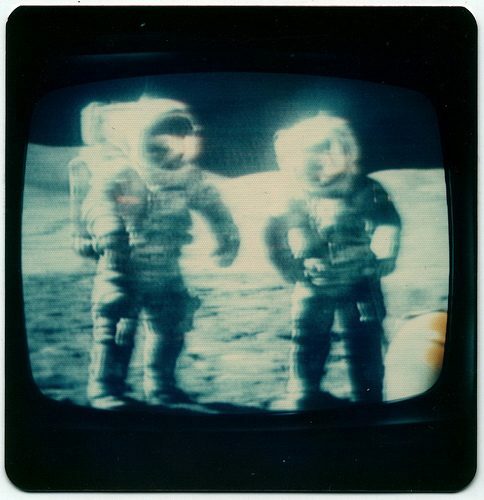 NOTE: The method now used by NASA (as mentioned above) keeps the HAM OPERATORS from monitoring the astronauts-to-ground transmissions, but people with their own VHF/UHF transmitters/receivers (such as privately owned radio and television stations) could (and reportedly DID) monitor these conversations uncensored. NOTE: Would not the same apply to the cooling of the Earth? This could have applications to the Hollow Earth Theory, which proposes that, not only the EARTH, but ALL planets are formed with interiors that are essentially HOLLOW. *NOTE: There is a large obelisk in New Delhi, India that is VERY ancient, and is composed of iron that does not rust. See Erich von Daniken¹s books for reference. ³The Moon is a celestial freak in several other respects. Almost all other satellites in the solar system circle their respective planets in the same plane of the orb¹s equator. But not out Moon. Its orbit instead lies strangely closer to the Earth¹s orbit around the Sun. Puzzled scientists wonder: Why is our Moon circling the Earth outside this usual equatorial planetary orbit? They do not know. NOTE: The more scientists look at the evidence brought back from the Moon, the more they are convinced that it was formed at some remote corner of the Galaxy, and was captured by the Earth several thousand years ago. The problem with the capture theory is that, for one, the Moon is too BIG. Secondly, its orbit is too perfectly circular, and too far out from the Earth. (If it HAD been captured by the Earth, it would have an ELLIPTICAL orbit, not a perfectly circular one.) These facts, combined with the HOLLOW and seemingly ARTIFICIAL nature of the Moon, not to mention the Œcoincidental¹ positioning of the Moon‹the positioning that makes Earth the only planet in the solar system to experience total eclipses‹all of these discrepancies and coincidences are just too much to accept. As outlandish as it may seem, the theory of ŒSpaceship Moon¹ having been Œaltered¹ and steered into Earth orbit by god-knows-who several thousand years ago seems to be the only one that fits all of the evidence. NOTE: The fact that the Moon was once, of necessity, a planet in its own right, along with fact that evidence points to the Moon being hollow, could be an interesting piece of evidence in favor of the Hollow Earth Theory. (This theory holds that, not only our Earth, but ALL planets are formed hollow.) Therefore, the fact that the Moon is hollow does not necessarily mean that it is a spaceship fashioned by Aliens. It could simply mean that the Hollow Earth Theory is, indeed, correct, and that all planets are, in fact, formed hollow; the Moon having once been its own planet, until its relatively recent capture by the Earth. (Interestingly enough, the impossible celestial mechanics required for the Moon to be in its present orbit become much more probable if one considers it to be a hollow body. If, indeed, it was Œsteered¹ into our orbit by Œaliens¹ however long ago, this would certainly made their job a lot easier!). Unfortunately, orthodox scientists have as much (if not MORE) trouble accepting the Hollow Earth Theory as they do the Spaceship Moon theory. NOTE on the Moon¹s ³RAYS²: The so-called ³rays² that extend from and between many craters on the Moon were found by Apollo astronauts to be composed of a fine, powdery chalk-like substance. (Much like the chalk-lines laid down on sports fields.) What could be the cause of these rays? It is interesting to note that the craters with the largest ray patterns are the ones in which the most ACTIVITY has been noted. (Bright lights, Œartificial constructions¹, and spraying.) The theory that these trails of dust are caused by meteor impacts is ruled out immediately, because most craters having rays have only one or two extending from them. (Only the Œbusy¹ craters have many of them.) A meteor impact causes derbis to be thrown in ALL directions. Even meteors hitting at an oblique angle would throw derbis in a complete arc along its forward direction. So what causes the rays? It seems a strange coincidence that the bottoms of the ³rayed² craters are heavily coated with the same white, powdery substance of which the rays are composed. The ³rays² are beginning to look like they were made by something ³tracking² the powder up out of the crater, and in a straight line to other craters. It was found by the Apollo astronauts that this powder clings to EVERYTHING, and was, in fact, a great nuisance to them, as it clung to their suits, faceplates, camera lenses, cables, etc., and even found its way into the Lunar Module, posing a bit of a housekeeping problem, as the powder lost its adhesive quality upon entering the atmosphere of the Lunar Module. So it is entirely possible (and quite likely) that these ³rays² are caused by spacecraft on the Moon. (Scientists have been UNABLE to come up with a NATURAL explanation, after all!) Now, whether these spacecraft belong to the U.S., the Soviets, or Aliens is purely a matter of speculation. I¹m sure there are strong arguments in favor of each of these possibilities. The facts are there; you are free to interpret them in any way you see fit. NOTE: Could a permanent space-station (such as the ill-fated SkyLab) be placed into one of these Lagrangian Points? It would be much safer than placing one in ORBIT, where there exists a chance that its orbit will decay, and cause it to come crashing down to Earth. The NASA number should be given in full. The cost for a single 8×10 B&W photo is $1.75 (check current price); for color, $5.00 (check current price). Postage & Handling fees are 15% of the total order ($2.00 minimum). ³The Rover encountered mostly loose dust and rocks on the Moon. This type of surface would have less traction than ordinary pavement. The Rover had a loaded Earth weight of 1,540 lbs. Under one-sixth gravity, only 128 lbs. of force would be required to make the vehicle slide. Therefore, in going the maximum speed of 10.2 MPH, the vehicle would begin to slide if the wheels were turned enough to make a radius of curvature of less than 84 feet. NOTE: The Apollo program DID discover that the Moon has a very feeble magnetic field. NOTE: While this argument is aimed at explaining the reason for the high gravity on the Moon, one can immediately see its importance as applied to the Hollow Earth Theory. NOTE:: This points out, as I stated earlier, that the Moon is not necessarily a Œspaceship¹ just because of this ringing. It does seem to point to the fact that ALL planets are, indeed, HOLLOW. Both of the above mentioned photos depict the Earth, and show the Œhole¹ at the North Pole from different angles, giving depth to the phenomenon, and allowing researchers to make quite accurate estimates as to the hole¹s width and angle of descent into the Earth¹s interior. These photos belong with the Hollow Earth research materials, but seeing as how I ran across them amongst the MOONGATE research data, I decided to include them here. After all, the more one researches ONE of these two theories, the more light is shed on the other.